Tina Drysdale is doing what she can to help fix a problem that’s not easily solved — one that is dependent on people who care. She raised $90 towards a $6,000 fundraising goal in the two-day March Together event to help agencies that help the poor and homeless. One of the beneficiaries is the new city soup kitchen. It alone has a $100,000 budget, all to be raised through donations. There are six aid agencies sharing equally in the walk proceeds, so the need for money is great. “It’s in our heart to do whatever we can. And really, you know walking around the arena . . . it really is a small price to pay,” Drysdale said. She walked around the rink inside the Harry Lumley Bayshore Community Centre Friday afternoon with JoAnn McFarlane. Both are members of Crossroads Victory Church, whose pastor, David Mathieu, sits on the board of the Owen Sound Hunger and Relief Effort or OSHaRE, which runs the soup kitchen five nights a week. Drysdale, McFarlane and Mathieu were among 16 people on four teams registered Friday who raised more than $2,000 for the cause. 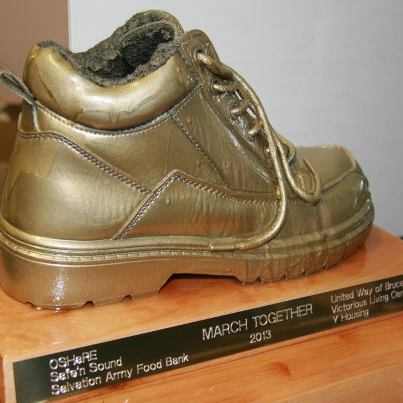 Today more people will walk starting at 3 p.m. at the United Way office downtown and ending with a chili supper at 5 p.m. across the street at the former Knox United Church, now Harmony Centre Owen Sound. McFarlane said she feels called to do what she can when she was asked why much of the burden of helping people in need should fall to ordinary people. “For me the joy is that we’ve come together as a community to provide for these people who very much need it,” she said. The six groups involved in the fundraising walk all serve the same group of people but there has been tension among some of them. This event is the first of to work together to raise money, which will be shared equally among them. Walk chair Andy Fletch said it will become an annual event. The benefitting groups include OSHaRE; Safe ‘n Sound, the after-hours emergency housing referral service and drop-in centre; the Salvation Army food bank; and Y Housing, which arranges emergency shelter stays and long-term accommodations. The Y will use the money to buy toiletries and other supplies for clients in urgent need. The Victorious Living Centre runs the only emergency shelter in Grey-Bruce, as well as a drop-in centre, and walk-a-thon funds will support those efforts too. The United Way will use its share of money raised to pay heating cost arrears where furnaces burn wood, oil and propane. Other programs cover gas and electricity arrears. United Way executive director Francesca Dobbyn, who registered walkers Friday, said changes in provincial funding as of Jan. 1 have cut certain programs for the poor and made them more difficult to access. Dobbyn said one implication is that someone in county geared-to-income housing who is disconnected for utilities arrears would be evicted because they’re no longer eligible to access provincial utilities arrears funding. In the past, a combination of funds from the United Way and the county, which receives provincial funding to keep people housed, would pay the arrears and those people could stay in their homes. Now if someone is in county geared-to-income housing they don’t qualify to access funds for utilities arrears in Grey and Bruce counties, Dobbyn said. She said the province’s thinking is that those people in social housing are already getting a break by paying less rent and so they shouldn’t also dip into the other funds. She questioned the ethics of that. Regardless, she said, it will mean more people will lose housing and they will place more demands on charitable organizations, which makes the March Together event that much more important.